If you are short of time, the answers to the following 3 questions should let you know all you need to about the Oral-B Vitality. If we have missed something, let us know in the comments. If you want more detail, you can read our full Oral-B Vitality Review further down the page or watch our video review. No, there is little you could class as wrong with this brush. However, being honest, it is worth spending a few extra dollars to get a couple more value added features that are on offer from the Pro 1000. The Vitality does clean the teeth fairly well it also has a 2 minute timer built in which is good. However, the lack of quadpacer and battery status is a frustration. There are many alternatives you could consider alongside the Oral-B Vitality, our recommendation is the Oral-B Pro 1000. The slimmer handle and better battery life are worth the extra spend in my opinion. 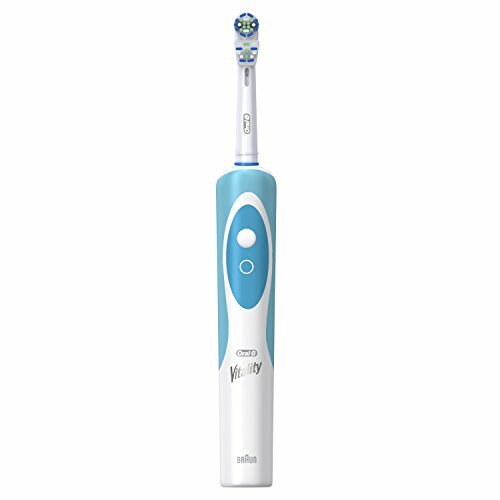 You can also check our latest recommendation here for the best cheap electric toothbrush, which happens to be the Fairywill FW-917. 3. Where is the best place to buy the Oral-B Vitality? Amazon is a particularly popular outlet to buy from because they tend to be the most price competitive and offer quick delivery options nationwide. Our price comparison table below shows some of the cheapest online stores and it’s always worth checking out eBay, too. Oral-B market the Vitality on their own website with the FlossAction brush head included. However there is another version, with the Dual Clean brush head included. Both are the same aside from the brush head. So if shopping around, be aware that the only difference between the Vitality Dual Clean and the VItality FlossAction is the brush head. Offering the most basic of features from an electric toothbrush the Vitality will clean the teeth fairly well and likely be an improvement on any manual brushing, but it is not really the ‘best’ brush you can buy for the money. Read on to find out more and understand why. What are the good and bad points about Oral-B’s Vitality toothbrush? Timer – A 2 minute timer is built into the brush handle to encourage brushing for the right amount of time. Brush heads – Unusual at this price point to get 2 brush heads included. Brush heads – The Dual Clean in particular is an older style of brush head and not necessarily as effective. Timer – Lacks a quadpacer which is really helpful in encouraging cleaning habits. The Vitality comes packaged in a few different ways. You will potential see it on store shelves as the Oral-B Vitality FlossAction or the Vitality Dual Clean. Aside from the brush head, they are the same brush. It depends on where you are as to which brush head is included. The differences in the brush head styles I will explain shortly. Out of the box a nice thing to note is you actually get 2 brush heads included, which is unusual, as normally it is just one. Seeing as a single brush head is normally around $5 it’s not bad going. A simple box contents, there is the brush handle, the heads, a charging stand and documentation. The handle is sealed, meaning it is waterproof and can be rinsed under the tap, used in the shower etc. Avoid complete submersion in water though. The charging stand will resist a few splashes, but avoid getting that wet. Inside the handle is the battery and motor that makes the brush work. The whole unit is powered on by the one and only button on the front of the brush handle. In the upper third of the brush handle, the Blue coloured button needs to be pressed to turn the brush on and off. When powered on, the brush will launch into the one and only cleaning mode available on the brush. That power button is part of a larger Blue coloured piece of rubber that sits on the front of the brush handle. Contrasting with the main body of the brush handle, of plastic construction, smooth to the touch, it is a gloss White colour. Around the neck and stretching down the back of the brush handle is a Blue/Green/Turquoise coloured rubber that offers lots of grip to the handle. It is soft to the touch and the fingers naturally stick to the ridges that run along the back of the handle. The result is a trio of colours that work fairly well together and certainly catch the eye. It does lack the finesse of more premium brushes. Please note: In some instances the Blue coloured rubber is replaced with a Green colour. The detachable brush heads slide on and off the metal prong on the top of the handle. This prong feeds down inside the handle to the motor..
With the brush head attached and the brush powered on, the timer built into the brush begins to start counting down. You don’t get any clue of this until 2 minutes have passed, at which point the brush motor will pause briefly 3 times causing a change in the sound and motion. This is the timer that tells you the recommended cleaning time has passed. Now, more expensive brushes have something called a quadpacer built in, which in my mind is more useful as it encourages even brushing across the mouth. Brushing for the full 2 minutes is very important, but just as important if not more so, is the right technique. Make sure you learn how to clean your teeth properly, you don’t use an electric brush in the same way you do a manual toothbrush. Another downside here is that the Vitality only uses the 2D oscillating and rotating movement of the brush head, compared to the heavily advertised 3D movements that more premium models offer. Whilst he clean is good, it is not the best cleaning of your teeth you have very had. It is easier and can most certainly remove more plaque than when brushing manually. The added pulsations that come on models like the Pro 1000 can long term have a more beneficial effect. You get 10 cleaning sessions of 2 minutes from the battery built into the Vitality. Unfortunately there is no warning from the brush when the battery is low. There is no battery icon, so it’s up to you to recharge it regularly if you want to avoid it going flat mid clean. Whether you opt for the Dual Clean or FlossAction variant of the Vitality, both brush heads are designed to clean the teeth well, cleaning the tooth surface, including in between teeth and along the gumline where bacteria likes to reside. The FlossAction head is better for getting deep between the teeth, like dental floss might, whereas the Dual Clean heads are a little less focused on this interdental cleaning. In fact the Dual Clean head is a slightly older style of brush head and one that is not provided or typically used on the premium brushes, the Floss Action head is. Any of these can be used on the Vitality brush handle if you choose. If you are a frequent traveller then this is unlikely the brush for you. The internal battery lasts just 20 minutes on the Oral-B Vitality. That is equivalent to 2 cleans a day for 2 minutes for 5 days. This sadly is one of the worst battery run-times available on an electric toothbrush today. Many last for 7-14 days with some Sonicare models lasting up to 3 weeks, but to be fair you do have to pay for this. Now the reality is that most of us use an electric toothbrush and leave it in the bathroom and/or place it straight back on the charging stand. There is no issue with this, but it reconfirms that actually battery life is not always that important. However, if you do travel frequently and are away for around 5 days or more you are going to need to consider what you do about charging the battery inside. Built into the handle and not user accessible, is the Nickel Metal Hydride battery. This is an older style of battery, with manufacturers normally opting for the newer Lithium-Ion technology. It is not a massive deal here at this price point, but Nickel Metal Hydride batteries are known to wear out quicker. Good practice to extend the life of the brush is to fully discharge and recharge the battery every 6 months. Now, most of us will know roughly when the brush was last charged and can easily pop it on the charging stand, but something to bear in mind if you don’t keep a mental note of when it was last charged, because you get little warning, as the battery runs down the motor will get slower and the clean worse. It may also cut out mid brushing. In the box with the Vitality Dual Clean is a typical charging stand. The White plastic item sits on a countertop and connects to the socket for power. There is no icon on the handle to confirm the brush is charging, but from flat to full you should expect it to take about 16 hours. If it was not already clear from what I have outlined already, the Vitality is by no means an expensive brush, but it still commands a retail price of $24-30. In all honesty, I have yet to find it selling much below this price — there is a live price comparison here. At this asking price it falls within the budget category and makes it fairly affordable for most. Factor in the cost of replacement brush heads, which typically works out at around $5 per head and over a 3 year period (our standard calculation) and the Vitality will cost $74 or $0.07 to own per day. This is pretty reasonable, but honestly, although a few dollars more, there are better options out there in my opinion. The Sonicare 2 Series or Oral-B’s Pro 1000 are better options, but I do understand for some these may be too expensive, particularly when you consider the price compared to a manual brush. Where you need to keep things as cheap and as cost effective as possible, the Vitality, be it with the FlossAction or Dual Clean brush head is great step forward in improving your oral health, gaining some of the advantages an electric brush brings. Backed by a 2 year manufacturer warranty you can be assured that the Oral-B Vitality will be covered if anything goes wrong within the first 24 months of ownership. Typically we find that brushes will last on average 3-5 years, so all being well you will get more value from the brush. Whilst the Vitality is not the best brush we have seen or handled, made by one of the leading brands, a thorough hands on gives us no immediate causes for concern. It is fairly solid and it is a sealed handle protecting you and the internals from water which it will of course be exposed to. The weakest point tends to be the battery. After repeated charges and discharges it can fail and should it, they are not easy to replace. This is because the Vitality has an older battery technology. It still works, but more prone to failure. If it fails during the warranty period it would be replaced. Just something to be aware of. The Oral-B Vitality is a budget electric toothbrush. It will bring you some clear advantages over and above a manual brush. A consistent cleaning motion and power delivery as well as the built in timer are the most notable advantages. Whilst cheap, realistically if you are looking to invest in your oral health it is worth spending a few dollars more to pick up a brush with a better battery life, more power and features that can really help you improve your clean. Seriously consider the Oral-B Pro 1000, you will likely be thankful that you did. The Vitality is ok, but nothing more. Is the Oral-B Vitality an oscillating brush? With the Oral-B Vitality, you get one brush head with the toothbrush itself. It depends on the package you pick up, there are different variants. Most common is the Dual Clean or FlossAction brush head that is provided. You can change the head with any others on offer from Oral-B. There are many that work with the brush handle. There are 6 main brush head options that include Cross Action, Floss Action, Pro White, Sensitive, Precision Clean and Deep Sweep. Does the Oral-B Vitality have Bluetooth? Does the Oral-B Vitality have sound connectivity? Does the Vitality come with a warranty & how long is it? If purchased new from an approved retailer the Vitlaity will come with a 2 year warranty. Does the Vitality have a built in timer? Yes. It has a timer which vibrates as the 2 minute daily cycle has been completed. It does not have a quadpacer. Yes, a charging station is included with the Oral-B Vitality. The Vitality charging station has not been designed to be fixed to a wall. Can I use the Oral- Vitality in the shower? Do you own or have you used the Oral-B Vitality?